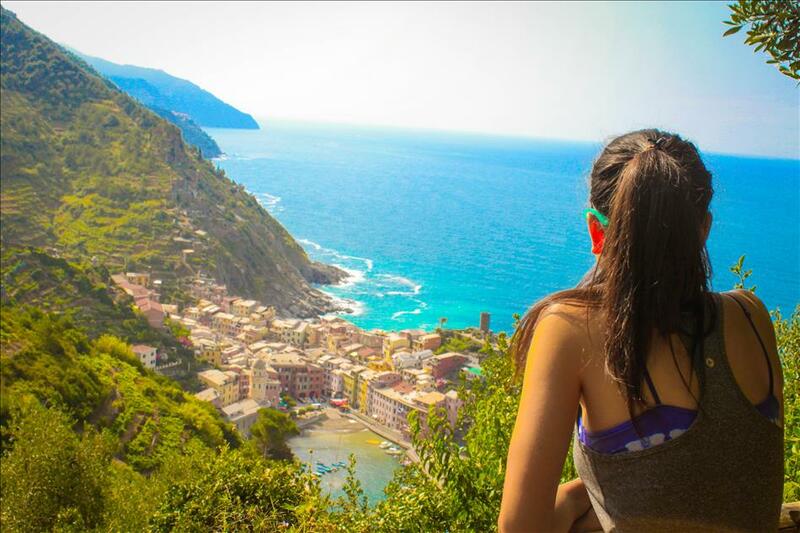 Along the mountain cliffs of the Italian Riviera’s Cinque Terre is a ribbon of trail aptly named the Azure Path that offers breath taking views of the coast, seaside towns, and countryside. The four leg journey is considered to be one of the most spectacular hiking trails in Italy. This July, only the section between Monterosso and Vernazza was open, which was fine as it is famous for having some of the most scenic views of the whole journey and would still take an hour and a half to two hours to complete even though it is only 3.5 km or about 2 miles. At 7 a.m. we left the historic Ville Montale which was our home in Monterosso and made our way through the village to the beginning of the footpath. Shop keepers were up early greeting each other and setting up their vibrant shelves of fresh fruits for the day, umbrellas were being unfurled in anticipation of the tanning masses, and the smell of freshly baked bread was in the air as loaves of bread were being placed into ovens across the town. 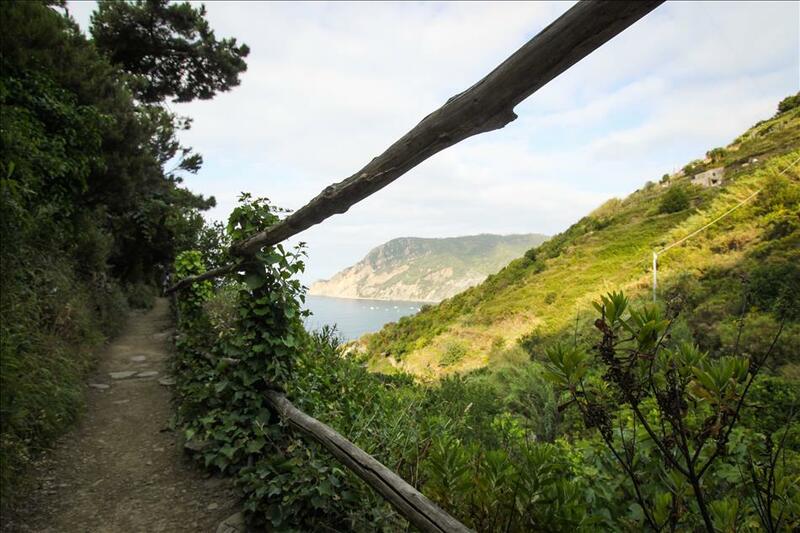 The path from Monterosso to Vernazza starts right up with a bit of cardio leading up a long and steep stone staircase cut into the rocky coastline. Views of Monterosso get better with each step yielding a better vantage point of the ocean framing the coastal village buildings like little colored bricks along the water. The hike was varied with some fairly easy flat dirt paths, and some steep stone steps, but the one thing that was constant was the unparalleled beauty of the landscape. The views of the little cliffside lemon and orange citrus orchards and green grape vineyards framed with gardens of pink and violet hydrangea and heather were more picturesque than paintings. All along the paths were evergreen oaks offering shady refuge from the bright morning summer sun. The path leads across an antique stone bridge straight out of a fairy tale illustration; its resident troll seemed to be out. With every new section of path emerged new picture perfect enchanting scenery. 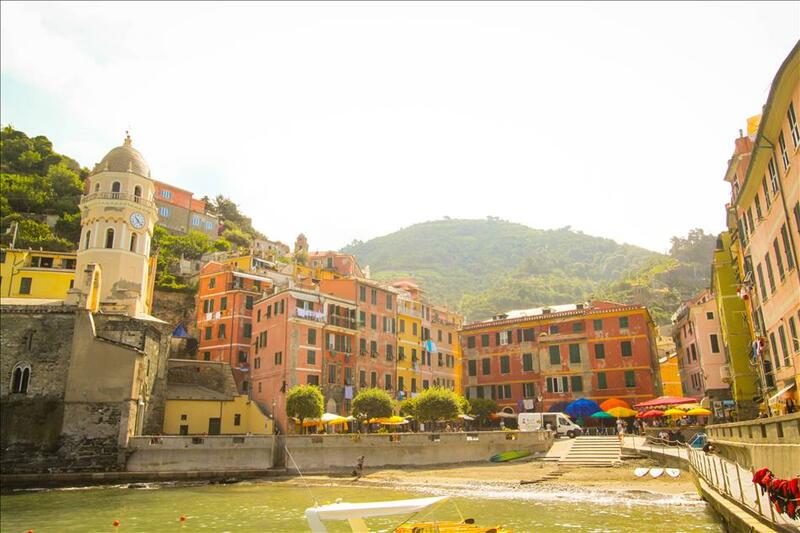 The climax of the stunning landscape is the approach of Vernazza. 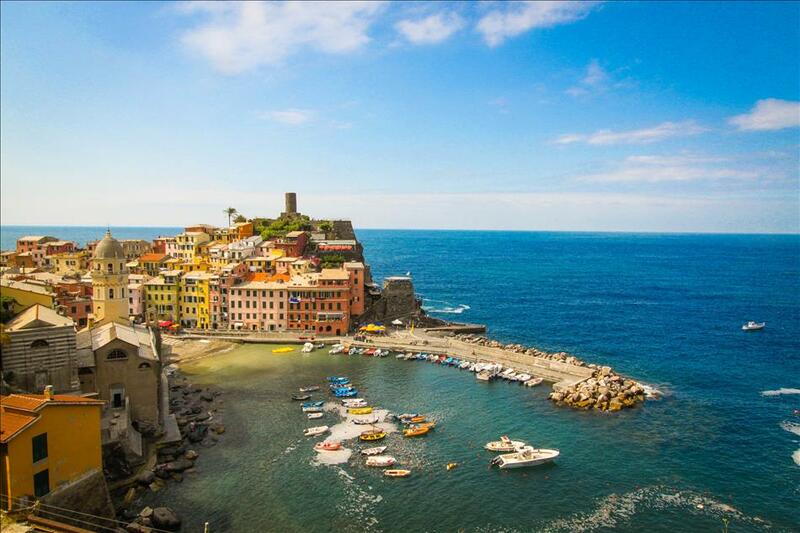 The path is littered with look outs where one can rest and take in the absolutely stunning bird’s eye view of Vernazza village in all its charming and colorful glory. Olive trees and small farms line the path and you can hear locals at breakfast clinking plates and chatting rising to another day in coastal paradise. The path ends in a slope down towards the village along which an accordion player was serenading the early morning hikers welcoming them into the town. The Italian accordion melodies filling the air added the icing on the surreal cake that had been my morning up until that point and I had to pinch myself to make sure I hadn’t dreamed the whole thing up, but even dreamland has never treated me to such perfect gorgeousness. Narrow pathways through the fishing village dwellings lead to the end of the hike at the Vernazza harbor lined with boats of brilliant hues and cafés brewing this morning’s cappuccino. Our legs took a rest while we sipped tea and watched the first beachgoers wade into the crystalline waters. The hike took two hours total largely because I took over 300 photos. It wasn’t very difficult and definitely wasn’t scary to dispel anyone hesitant of adding the hike to their itinerary. The hardest part being the stairs can be taken at a slow pace with rests. Hiking the Sentiero Azzurro was my absolute favorite thing that I did in Italy if simply for imparting upon me the knowledge that such picturesque places can and do exist off of a canvas.